Hollywood Woodwind Silver Edition is 16-bit, with one mic position (mid-tree, no divisi) Essential set of articulations and instruments with limited legato. Upgrade to Hollywood Strings Gold- and Diamond-Edition when you need more options. The Silver Edition is a download. From ACADEMY AWARD, C.A.S. (Cinema Audio Society), BAFTA, and EMMY award-winning sound engineer SHAWN MURPHY, who has recorded and mixed the scores for more than 300 feature films including Indiana Jones and the Kingdom of the Crystal Skull, Star Wars: Episode II - Attack of the Clones, Star Wars: Episode III - Revenge of the Sith, Star Wars: A Musical Journey, Jurassic Park, Jurassic Park The Lost World, Harry Potter and the Prisoner of Azkaban, Titanic, Minority Report, The Bourne Ultimatum, Saving Private Ryan, Munich, The Passion Of The Christ, X-Men: The Last Stand, and Ice Age, etc., Hollywood Orchestral Woodwinds is the third installment in the Hollywood series, and was designed to be the most detailed collection of orchestral woodwind instruments ever assembled. Alto Flute, Bass Clarinet, Bass Flute, Bassoon, Clarinet, Contra Bass Clarinet, Contra Bassoon, Eb Clarinet, English Horn, Flute, Flute 2, Oboe, Piccolo Flute. But most importantly check out our articulations chart at "more infos" which really shows how far we went to create the ultimate orchestral woodwinds library. No Shortcuts here!! 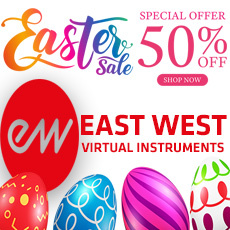 Includes PLAY 64-bit/32-bit software on both MAC and PC, powerful scripting for ease of use, more user control and detail than any other collection, all recorded in the world famous EASTWEST Studio 1, the home of major Hollywood soundtracks and television themes.